Christmas nativity scenes recreated by cultures from around the world are on display in six University of Notre Dame campus buildings from Nov. 28 through Jan. 31. The third annual International Crèche Exhibit and Pilgrimage features 30 crèches on loan from the Marian Library at the University of Dayton. The exhibit is sponsored by the McGrath Institute for Church Life. A prayerful pilgrimage to view the crèches will be held Dec. 4 (Sunday). The event begins at 2 p.m. with a brief presentation by John Cavadini, McGrath-Cavadini Director of the McGrath Institute for Church Life, and an activity for children at the Eck Visitors Center. The pilgrimage will move from the Eck Visitors Center through campus to the other displays and end at the Main Building. Pilgrims are invited to bring the baby Jesus from their home crèche for a blessing. All are welcome. “During the Advent and Christmas seasons, the presence of the animals in the nativity scenes calls us to reflect on the participation of all of creation in joyfully welcoming our Lord in his infancy,” said Cavadini. The theme of the exhibit is “The Friendly Beasts: Imagining the Animals at Christ’s Nativity,” borrowing the title from a traditional Christmas hymn. The crèches selected for this year’s display feature a diverse array of animals. Some scenes include donkeys, sheep and cows thought to be present at Jesus Christ’s birth while other sets reflect creative cultural interpretations such as alligators, frogs, a polar bear and a rooster. The crèches will be on display in the Eck Visitors Center, Morris Inn, Coleman-Morse Center, Main Building, Geddes Hall and Hesburgh Library. Visitors are encouraged to make self-guided tours of the crèches using booklets available at all exhibit sites. 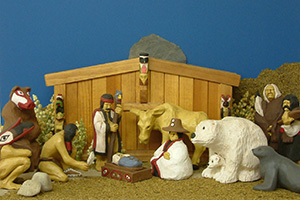 The nativity sets were created by artists from Brazil, Ecuador, France, Germany, Ghana, Guatemala, Italy, Kenya, Peru, the Philippines, Switzerland, the United States and Venezuela. The Christmas crèche originated with St. Francis of Assisi in the year 1223. St. Francis recreated the night of Christ’s birth in a cave near the town of Grecio, Italy, to arouse the devotion of the town’s inhabitants. The McGrath Institute for Church Life at Notre Dame partners with Catholic dioceses, parishes and schools to address pastoral challenges with theological depth and rigor. By connecting the Catholic intellectual life at Notre Dame to the life of the Church, the McGrath Institute for Church Life forms faithful Catholic leaders for service to the Church and the world. For more information, visit icl.nd.edu. Originally published by Brett Robinson at news.nd.edu on November 28, 2016.